For years...even centuries...people have been completely satisfied with plain white soap. It may have been a bit beige, or cream colored, or even "Ivory" - but it was basically white...all white...the whole bar. With the renaissance of homemade soap, though, the bar of soap has become a canvas for crafters to create magnificent works of soapy art. While the colors swirled through the soap don't change its cleansing or moisturizing qualities, they certainly change the aesthetic nature of the soap. Here are a collection of videos and tutorials to help you create swirls in your own bars of soap. With some experience, you'll be a master swirler in no time! 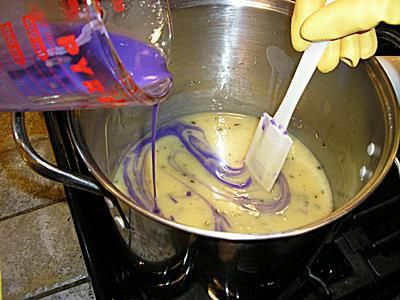 The basic one-color "in the pot" swirl is a great place to start swirling. It's the technique used in a basic "How to Make Soap" tutorial. The video is technically a "two" color process - but one of the colors is mixed throughout - and one is swirled. This technique layers two colors into a loaf mold and then allows you to swirl them together to the degree that you want. You can leave it just lightly swirled, or really mixed together well. This swirl technique became an instant sensation when an Italian Facebook video was discovered back in 2011 which shows an artist doing a column pour with paint. We soap makers said, "I have to try that with soap!" The principle is pretty much the same - pouring multiple colors of soap over a column. This tutorial uses a square slab mold and mixes four colors together. It's just a variation on the basic technique of swirling, just with more colors mixed in. This tutorial from Soap Queen Anne Marie at Bramble Berry shows how to do the "mantra" swirl - an advanced "in the mold" technique that gives a really cool effect. You'll need some cardboard cut to the length of your loaf mold - and an extra set of hands is a big help too! This swirl technique is similar to the column pour in that it incorporates multiple colors poured into the middle of a slab mold. However, instead of pouring them over a wood or plastic column, they are poured directly into the center of the mold through a funnel. The effect is very similar, and an extra set of hands to hold the funnel is really helpful. This swirl, a close cousin to the funnel and column pour swirls, is here shown in modified, easier version by Kenna at Modern Soapmaking, is really cool. It looks, just as the name implies, like a tiger's stripes. Swirls do best with micas, oxides, ultramarines or natural colorants that aren't going to bleed. But there are so many available, and they're very affordable. Get a sample of a few and just play. You can't do anything "wrong" to your soap with the colors, and you may create a wonderful soapy work of art!